yo and pull through 3 loops. work 1dc in each of next 2st, yo and pull through 3 loops. Size to fit approx:- 18” Chest, 3-6 Month Baby or Doll. Rib - ch3, * 1dcf in next dc, 1dcb in next dc, * rpt from * to * to end, 1dc in top of ch3. Turn. (see abbrev for dcf & dcb) Rpt last row twice. Turn. Pattern Row 1 - ch1, sl st loosely in base of ch1, * 1trc in next dc, sl st loosely in next dc * rpt from * to * to end. Turn. Join in main color yarn and rpt Pattern Rows 1 & 2 eleven more times each until 27 rows have been worked in all from Rib or work measures approx 9.5”. Turn. Shoulder Fastener - ch1, 1sc in base of ch1, 1sc in each of next 11dc. Turn. (12sc). Work 1 more row in sc on these 12 stitches. Turn. Next Row - ch1, 1sc in base of ch1, 1sc in each sc and ch2 space to end. Turn. Work 1 more row of 1sc in each sc to end. Fasten off. Sweater Front - Rpt from # to # on back of sweater. Join in main color yarn and rpt Pattern Rows 1 & 2 four times each. Fasten off. Pattern Row 1 in contrast color. Fasten off. Pattern Row 2 in main color. Fasten off. Pattern Rows 1, 2 and 1 in contrast color. Fasten off. Pattern Row 2 & 1 in main color. You should have 22 rows worked in all from Rib, (work measures approx 8 Inches). Turn. Next Row (Dec Row) - ch3, 1dc in each of next 9sc, dc2tog over next 2st, 1dc in last sc. Turn. (11dc + ch3). Fasten off. Next Row (Dec Row) - ch3, dc2tog over next sl st and trc, 1dc in each of next 11st. Turn. (12dc + ch3). Next Row (Dec Row) - ch3, dc2tog over next 2st, 1dc in each of next 10st. Turn. (11dc + ch3). Fasten off. Rib - ch3, * 1dcf in next dc, 1dcb in next dc, * rpt from * to * to end, 1dc in top of ch3. Turn. Rpt last row twice. Turn. 4th Pattern Row - (Inc Row) ch3, 1dc in base of ch3, 1dc in each st to last sl st, 2dc in last sl st. Turn. (30dc + ch3) Fasten off. Join in main color yarn and rpt 1st to 4th Pattern Rows until 36dc + ch3 remain. Next Row - ch1, sl st loosely in base of ch1, * 1trc in next dc, sl st loosely in next dc, rpt from * to * to end. Turn. Next Row - ch3, 1dc in each st to end. Fasten off. With WS side facing and 5.00mm hook, join right hand side shoulder seam together by slip stitching loosely or over sewing with a needle and yarn, leave left shoulder seam open (the side with extra rows on back for fold over and buttonholes), fold sleeves in half lengthways, then placing centre folds to shoulder, over sew with needle and yarn or slip stitch loosely in position. Join side and sleeve seams together by over sew or slip stitch. Next Row - Work ch1, 1sc in base of ch1, 1sc in each of next 28sc, sc2tog (see abbrev) over next 2sc, 1sc in each of next 13sc, sc2tog over next 2sc, 1sc in each sc to end. Turn. Work one more row of 1sc in each sc to end. Fasten off. Finishing - Sew in and tie off any loose threads of yarn, sew on buttons to correspond with buttonholes on shoulders and fasten. Rib - ch3, * 1dcf in next dc, 1dcb in next dc, * rpt from * to * to end, sl st to top of ch3 on beginning of row. Turn. Rpt last row twice. Turn. Next Row - (RS) ch3, 1dc in each dc to end, sl st to top of ch3 on beginning of row. Turn. Pattern Row Two - ch3, 1dc in each st to end, sl st to top of ch3 on beginning of row. Turn. Rpt Pattern Rows One & Two once more. Fasten off. Join in main color yarn and work Pattern Rows One & Two six more times. Turn. Work Pattern Row One once. Turn. Work measures approx 6.5” from beginning. Divide for legs - ch3, 1dc in each of next 44dc, sl st to top of ch3 on beginning of row. Turn. Working on these 45 stitches rpt Pattern Rows One & Two twice. Turn. Fasten off. Join in contrast color yarn and work Pattern Row One & Two once. Turn. Rib - ch3, * 1dcf in next dc, 1dcb in next dc, * rpt from * to * to end, sl st to top of ch3 on beginning of row. Turn. Rpt last row twice. Fasten off. Second Leg - Return to remaining stitches at division, re-join main color yarn to next stitch, ch3, 1dc in each of next 44dc, skip last slip stitch, sl st to top of ch3 on beginning of row. Turn. Continue Second leg same as first leg. Chain Tie - With 4.00mm hook and main color yarn, ch130, sl st in 2nd ch from hook, sl st in each ch to end. Fasten off. Finishing - Sew in and tie of loose ends of yarn. Close small gap on crotch. Thread chain tie through alternate dc's under rib on waist and tie with a bow. For tassels, cut 4 lengths of contrast color yarn approx 6” long, (twice) if you prefer a longer or a thicker tassel just add more length and more strips, attach tassels to each end of chain tie, by threading cut ends through last ch and pulling ends through loop to secure. Trim tassels so they are even. 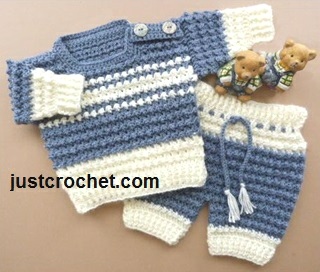 Hope you enjoy this free baby crochet pattern for a boys sweater and pants.